When I was a little girl, Kentucky Fried Chicken were novelty meals. The aroma of the fried chicken was heavenly and familiar and it meant some finger-lickin’ goodness was in store. Last Friday, I tasted Kentucky Grilled Chicken for the first time. Yup, not FRIED but GRILLED. The telly has been screening these ads for so many weeks now, and there was only so much I could do to restrain myself from trying this *healthier* option. In a bid to lure health-conscious consumers back into KFC (incidentally I learnt that it became KFC because the word FRIED in Kentucky FRIED Chicken needed to be dropped), KGC was introduced after two years of testing. The selling point is that it contains less calories, less fat and less sodium than its *fried* predecessor. The set meal I had contained 2 pieces of grilled chicken, mashed potatoes and gravy, coleslaw, and instead of the bun we have in Malaysia, the set comes with a flaky crumbly buttermilk biscuit, which I absolutely LURVE! I am not sure if KGC has come to Malaysian shores yet, but I would say it may not be a big hit there, given that people are more inclined to fall back on the comforting reassuring KFC they know and love. Sure, they’ll try KGC one time at least, but Malaysian tastebuds would probably prefer the fried option. Have I made your tummies rumble yet? I would imagine the Walmart or Target roast chicken taste batter than KGC. They would have to taste as good as Nando’s before anyone will take it seriously. But I’m intrigued. I don’t mind giving it a taste! your pictures are making me hungry! 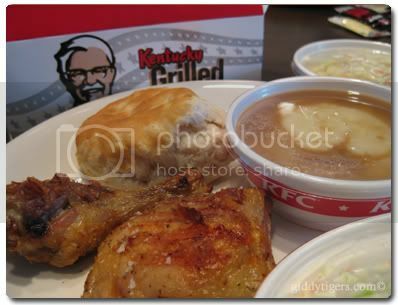 I wish I can find a KFC easily here in Paris and I wish my hubby is around now to help to hunt one for me! You sure did! The drumstick looked helluva pathetic though. I love those southern-styled biscuits too!! Like those that come with Popeye’s chicken! kfc over here sux. or maybe certain outlets are better. have made a concerted effort to avoid them actually. sad, cos they used to be my favourites. if KGC was in Malaysia..i’m sure the taste will be different too..like the KFC overseas and in Malaysia is slightly different ya..
eeeekk… pls KGC, come to Msia soon!!! !